Silence is the only sound in the city of Ghabra. Any form of expression is met by death. SAMT is the introduction to a dysfunctional society that is about to implode. SAMT is an animated short that raises the timely question of freedoms in the Arab world, and the repression thereof. It mainly deals with the topic of freedom of expression through movement. Whether it is the freedom of speech and ideas, or the freedom of being different and choosing a diverse path to the established status quo – SAMT touches on the wider reality of a rising Arab youth who have inherited decayed political, social, and economic systems, and who have found a way to express their voices through the recent uprisings that are still shaking the region in the hope of a better future. 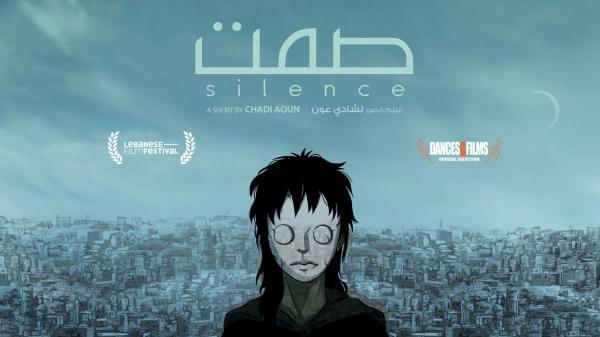 SAMT(silence) Trailer from Chadi Aoun on Vimeo. SAMT is a window through which questions are asked in the face of an established status quo. One of many windows that the Arab uprisings have opened, with unprecedented equal opportunity for all questions to be asked, and for raising the most painful debates on what makes societies change. Another parallel to the realities of the Arab world today, is the repression and crackdown of states on those movements for change to bring back the established ‘order’. SAMT can mean ‘silence’ in Arabic. But the richness of the Arabic language has a milder word for that, which could be ‘soukout’. Therefore, in the broader sense, SAMT takes a stronger meaning here, one of muteness, conveyed by the general absence of speech in the movie – and broken through a single sound to rise against it. It explores the absence of freedoms in a repressive system where there is no room for freedom of ideas, of movement, of choice, in a monochrome world where colors (differences) are prohibited. Another nuance is that silence or ‘noiselessness’ can mean calm, peace and quiet. But SAMT is intended to portray the meaning of ‘silence’ as it is lived and experienced by the Arab youth: a perpetual censorship, be it formal or socially imposed. With retrospective, I realize that with SAMT I naturally treated a subject that conveyed a deeply rooted rebellion against a crippling system. SAMT was a direct result of how I perceived things, an expression of the plight that all of us living in the Arab world share to various degrees, and which became, unexpectedly so, headline news nowadays: The ‘Arab spring’ and the need for freedoms, expression being one of those freedoms, and so versatile.